E. Young, “Sculptors’ Models or Votives? In Defense of a Scholarly Tradition”, Metropolitan Museum of Art Bulletin, Spring, 1964. P.A. Clayton, Chronicle of the Pharaohs, London, 1994, pp. 208-217. J.G. Manning, The Last Pharaohs: Egypt Under the Ptolemies, 305-30 BC, Princeton, 2009. 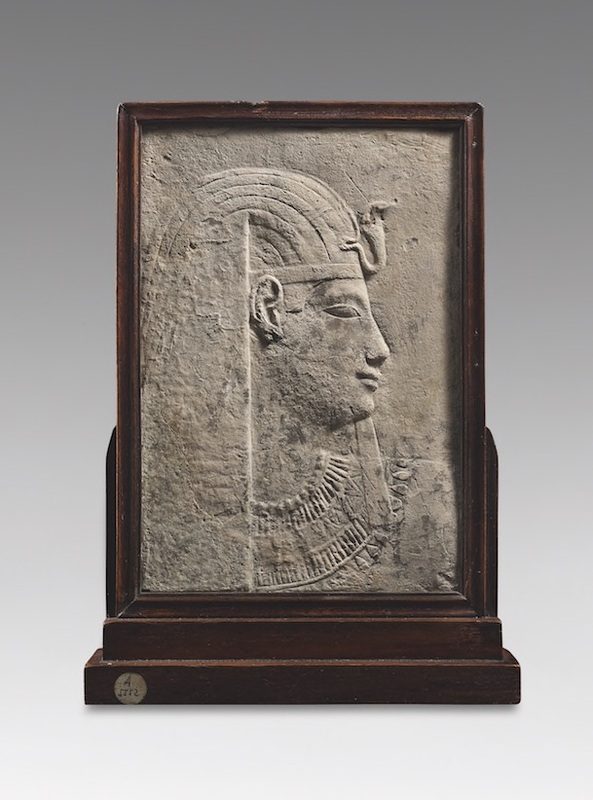 This beautiful fragment depicts the bust of a pharaoh in profile, modelled in low relief with finely-rendered details. The king is adorned with characteristic attributes, including the broad collar (usekh), the Nemesheaddress with sacred uraeus, and a false beard. Together, these symbolize royalty, emphasizing the role of the pharaoh as the protector of the people in life and in the afterlife. These features also assimilate the king with the divine, since Egyptian deities are often depicted with similar attributes. This serves to underscore the ancient Egyptians’ core belief in the divinity of kingship, and also lends a certain ambiguity to the identity of the subject, blurring the boundary between pharaoh and deity. The present portrait of the monarch demonstrates how the Greek Ptolemies commissioned Egyptian-style works of art, showing sensitivity to the time-honoured artistic traditions and political expectations of their Egyptian subjects. It conforms to the typical style of Ptolemaic portrait sculptures, features of which include a confident, enigmatic smile, clearly defined almond-shaped eyes, and an aura of divine detachment and self-satisfaction. The similarities in portrait sculpture between images of the last indigenous pharaohs and the new Hellenic rulers attest to the Ptolemies’ appreciation for the enduring power of the royal image, and their desire to continue a recognizable tradition in royal sculpture, helping to cement the link between past and present and to emphasize their commitment to the role of Egyptian king. This piece falls into the category of Egyptian sculpture known collectively as ‘Sculptors’ Models’, a technical aspect of Egyptian craftsmanship that began in the third dynasty of the Old Kingdom (circa 2686-2613 BC) and continued through to the end of the Ptolemaic period (circa 30 BC). These sculptures or reliefs have been interpreted as test pieces or instructive examples, used to assist sculptors in teaching more junior artisans how to carve the correct proportions for royal portraiture in the canonical Egyptian grid. Whilst their primary function was instructive, it is thought that such pieces may have later been dedicated as votives in temples. 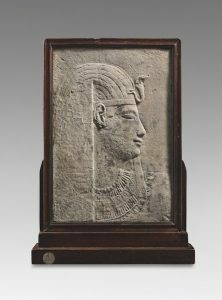 Two votive reliefs or sculptors’ models of similar character, depicting the profile bust of a pharaoh, are exhibited at the Nelson Atkins Museum of Art (inv. no. 41-44, see left), and the Art Institute of Chicago (1920.157, see right), respectively. A fragment from a larger relief depicting Ptolemy I, making offerings to Hathor is displayed in the Museum of Fine Arts, Boston (89.559).This piece once belonged to the collection of esteemed artist, collector, and patron of the arts, Werner Coninx (1911-1980). The son of publisher Otto Coninx-Girardet, who was founder of one of Switzerland’s top-selling newspapers (Tages-Anzeiger), Werner dedicated his life to art. Between 1945 and 1980, he amassed a significant collection, including nineteenth and twentieth century Swiss art, Old Masters, and Far Eastern art, as well as Tribal art and Antiquities. In 1973, the collection was transferred to the Coninx Foundation, and is now housed in the Coninx Museum in the residence where Werner once lived, to the east of Zurich. It remains one of the largest private art collections in Switzerland.